There will be no industrial development in the marine area next to Lelu Island. This year’s return of Skeena River sockeye is setting up to be the worst on record. As a result, First Nations along the river have agreed not to remove sockeye from the river, a decision made only once before when the same run returned in dismal numbers in 2013. The federal government is facing another lawsuit filed by a northern First Nation dissatisfied with the consultation process during the environmental assessment of the Pacific NorthWest LNG project. Members of a B.C. 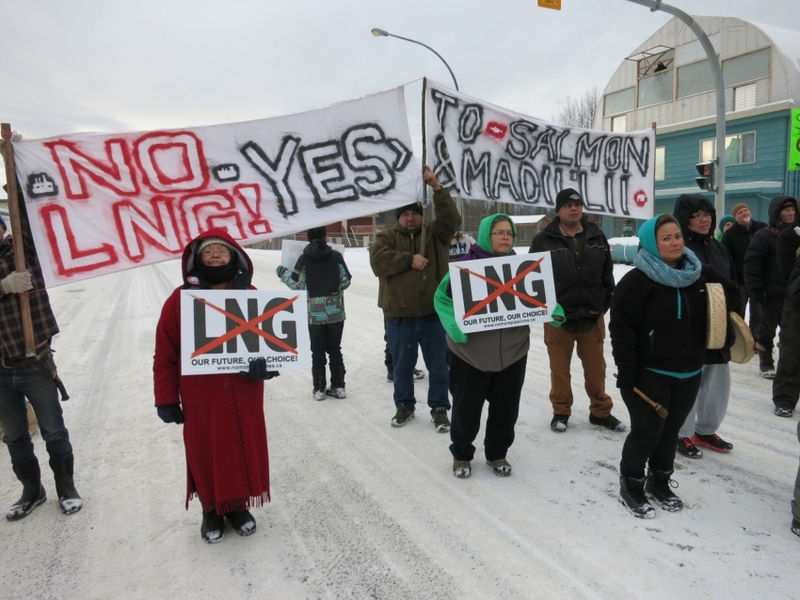 First Nation are launching another legal challenge of a massive liquefied natural gas project proposed for the province’s north coast. Several hereditary chiefs with the Gitxsan First Nation are in Vancouver today to announce their opposition to the Pacific Northwest LNG project, a project backed by Malaysia’s state oil company Petronas. Gitxsan hereditary chiefs blocking Highway 16 at New Hazelton, BC, Dec 6, 2014. Gitxsan hereditary chiefs blocked Highway 16 at New Hazelton, in northern B.C. on Saturday, to protest recent LNG project approvals by the BC Environmental Assessment Office. The chiefs say the projects could collapse the salmon population in the Skeena River if built. “The Gitxsan people have relied on salmon for thousands of years. The importance of salmon far outweighs any of the financial benefits that are and may be offered in the future for these LNG pipelines,” Spookw hereditary chief Guuhadakwa (Norm Stephens) stated in a release.